When I was in the final stages of producing my doctoral dissertation I ate out a lot. Escapism, most likely. During one such luncheon at Panda East, a fine Chinese restaurant in Amherst, MA, I opened a fortune cookie which read— Nothing worthwhile is ever accomplished without passion. I thought of some of the great names throughout history for whom this proverb has proven true— Hammurabi, Moses, Alexander the Great, Jesus, Christopher Columbus, John Harrison, Albert Einstein, Orville and Wilbur Wright, Vladimir Ilyich Lenin, Thomas Edison, Mother Teresa, Ronald Reagan, Osama bin Ladin, even Barrack Obama— all were driven by passion and tenacity to accomplish something beyond themselves. Yet, the church in North America seems driven by balance— balance in life, in our families, in faith, in our behavior— moderation in all things, no rocking the boat, no swimming against the current. Straight-forward, rational explanations of life should suffice to renew the mind and focus our resolve. It is almost as if being out of balance, off-center, or slightly extreme in any way is viewed as the real threat to the church and to the stability of our individual faith. But if Truth is primarily personal (though certainly not exclusively), found in the Person of Jesus Christ, there are some very critical implications. It impacts our Christian lives, balanced or otherwise, and how we demonstrate our faith to others. If point and counter-point propositional arguments no longer dominate the apologetic of our faith, or even sustain the curiosity of the normal Western cultural person, then maybe it’s time to express our faith in ways not so idealistic or rational…, or not even so balanced. As you continue reading you will detect a couple shifts. The first shift is one of approach. We move from the historical analysis of the previous chapters to a thoughtful consideration of our present day dilemmas; from the BIG strokes throughout history, to a specific manifestation of one era, one geographic location, one time, one individual—Jesus Christ. For in His life we can find the bridge between the preModern, Modern, and postModern perspectives on what it means to live in context within a specific culture. What I hope to do is to convince you of the importance of living your Christian life as Jesus lived His— in the context of whatever world you find yourself in. Right up front I want to admit that this chapter (okay, the whole book) is a polemic (that’s argument) for us to grow a non-balanced faith, a passionate faith, an exuberant faith that is in love with Jesus Christ and with the people around us. The personality of our faith must outshine itspropositions to give its Truth a proper context. The second shift you will experience is simply one of writing style. The first chapters were data-weighted, historical, linear/sequential, and logical (A=B, B=C, therefore A=C, remember?). They were analytical; they stated a problem, built a case, substantiated an argument. We feel safest in the world of rational thought and logical argument. Most Christians feel safer in a world where rational argument, logic and words prevail. Why? Because the Western articulation of our faith was formulated not in the preModern Era that had an understanding of the spirit, of mystery and the heart, but in the Modern era, where logical consistency, scientific verification, and systematic cohesiveness prevailed. But modernism’s presuppositional perceptions do not ring as true within this postmodern era; nor do modernism’s assumed stances of the Bible as primarily a systematic presentation of Truth (excluding, of course, the incredible logic/debate style of the Apostle Paul). The language of the Bible is, predominantly, one of story, of history, of pictures and images; and they each tell a story, they bespeak of a passion for God and of a passion for life. They lay down laws for the functioning of a society. They raise real-life problems that required real-life solutions. They burst forth in song in praise of God Almighty. They give us a glimpse of the struggles of the early Christian movement through the Gospels, through circulated correspondence, and individual epistles. Far too long have we limited the expression of our faith to the logical/sequential analysis of the Euro-western hemisphere of theological constructs. We have raised the Truth of the Bible above its context-in-life. A saying I come across constantly is— “right beliefs produce right actions.” Have you heard it, read it? Sounds right on, doesn’t it? But in real-life it doesn’t quite work out that way. You and I know many individuals who claim the name of Christ, who believe the right stuff (or at least say they do), and whose lives reflect little of Christian character, compassion, or concern for the Truth. Contrarily, there is the opposite, popular belief— you can’t trust your emotions. As if emotions are less reliable than logical/sequential thinking. The assumption is that emotions are fickle, not as locked down as logical, rational thought process. The logical thought process can be locked down more than emotion. Emotions, by definition, shift more readily than belief systems. But what good is one without the other!? It would be comparable to releasing a chemical analysis of kissing. So now you understand the complexity of kissing better; and this is helpful…, why!?! Where do we come up with this stuff—for a need for cohesiveness, control over minutia, consistency, for a need to believe that people always act on their convictions? [Sociologists have tested it – they don’t. Even in church attendance.] I don’t…, always, do you? Remember, we all sin; we are all, at best, consistently inconsistent. Did this idea come from some male-ego approach that emotions are exclusively feminine and can’t be trusted? Men supposedly are the “logical thinkers.” Somehow this makes us more stable, more consistent. O please, spare me the stereotypes. Let’s face it, men are afraid to be out of control; and it is easier to be in control of thought than it is our emotions. 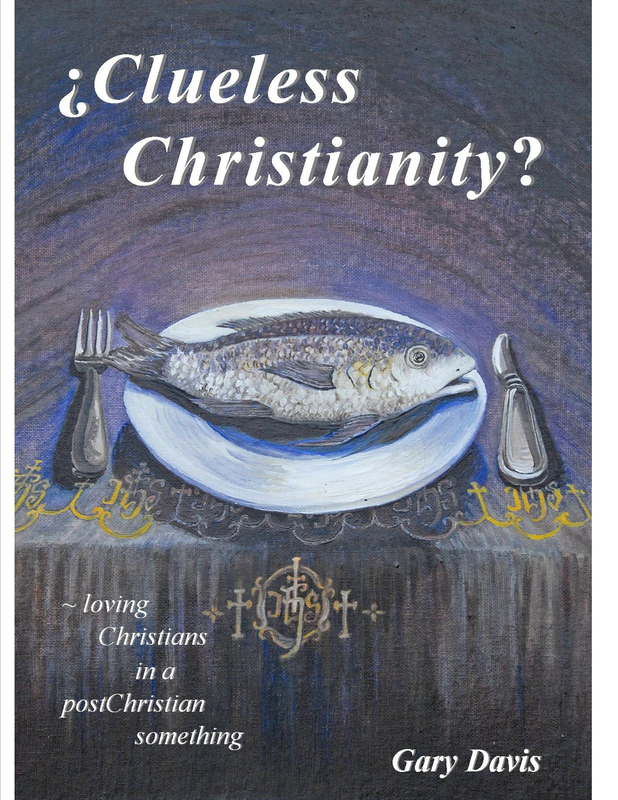 Posted on July 10, 2014 by needincPosted in Communcation, Faith in Culture, PerspectivesTagged Book, christian, Christianity, Clueless, Davis, Dr, emotion, faith, Gary, passion, thought, truth.